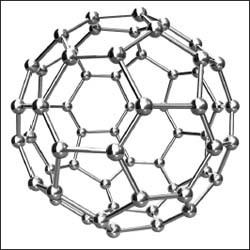 Buckyballs, or buckminsterfullerenes, are sphere-shaped fullerenes. The most common is C60, which is a sphere composed of alternating five- and six-membered rings of carbon atoms like a soccer ball. This molecule can actually be found in common soot, but don’t think you can start selling the remains of your bonfire for cutting-edge fullerene research—it’s very, very difficult to purify C60. Buckminsterfullerenes are sphere-shaped molecules made only of carbon atoms.